Siouxsie and the Banshees' recording career came to an end with 1995' The Rapture with the band splitting up the following year. As a result, Siouxsie and Budgie's side project The Creatures became the duo's full-time band. The two actually started recording new Creatures material before the Banshees split up so even if the latter hadn't disbanded, a hiatus would've been coming, similar to when The Creatures recorded their previous LPs Feast and Boomerang. During these sessions the duo recorded a lot of tracks and not all made it to their upcoming album, Anima Animus. Some songs were released as B-sides for following single releases, while the rest were treated with an EP release. 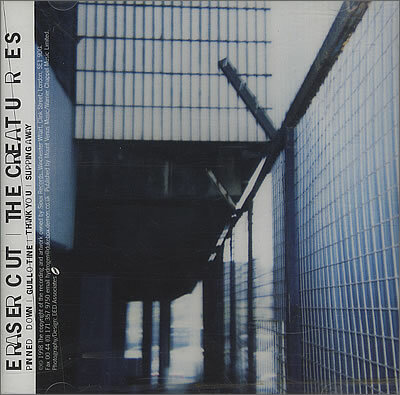 The EP, titled Eraser Cut (an anagram of 'Creatures') was released in 1998 and consisted of four tracks. Preceding the album whose recording sessions they were taken from, the songs provided their listeners a taster of what was to come. The opening number "Pinned Down" is the most traditionally 'Creatures-y' track out of the bunch with lots of tribal percussion elements such as marimba, bells and Budgie's trademark drumming, while also showcasing Siouxsie's new deepened and lowered vocals. However, it is the menacing "Guillotine" that shows the direction where the two were taking their music: the song, accompanied by an aggressively strummed acoustic guitar, is colder and harsher than anything they had done in years - be it as the Banshees or The Creatures. Yet, with its acoustic guitar and the handclaps towards the end, it feels like a natural evolution from the more Spanish-tinged moments of the Boomerang album, namely the songs "Standing There" and "Manchild". The electronic "Thank You" is another hint of the duo's newfound sound, but while it might have them going electronic, the big drums heard on the song are as distinctively Creatures-like as anything in their back catalogue. The most mesmerising moment on the EP would be the slowly unfolding closing song "Slipping Away" which also features a captivating vocal performance from Siouxsie: her voice might have been going through changes in the 1990s but by the time of this song she had certainly learnt how to use it, sounding as solid as ever. During this era, The Creatures went very DIY: they started their own record label Sioux Records and composed and recorded the material in their home, with Budgie's drum set being placed in the dining room (they wanted to keep a feeling of spontaneity in the process). And the results do indeed speak for themselves. This marked the beginning of a creatively very productive era for the two and Eraser Cut serves as a thrilling appetizer. "Sea of melting clocks / Tick tock, time dripping away" Siouxsie sings on "Slipping Away", but even time itself doesn't dare to touch the force to be reckoned with that is The Creatures - they're sounding more invigorating than ever! Try at least: "Slipping Away", "Guillotine"